Happy Friday! I don't know about you guys, but I'm so ready for the weekend! I look forward to my husband being home and peaceful mornings where we don't have to be in a hurry to rush out the door. These days we pretty much spend our weekends at home. We are still in the middle of lambing season on the farm and we pretty much have to be here 24/7 right now. This is my first year with sheep, and I can't believe how much I love it! It's a lot of work, but I'm continuing to learn, and our children are learning and getting experience right along with me. If you follow along with me on Instagram you've seen a few of our new baby lambs. They are so precious! We have one that we are bottle feeding, and that has been an experience in itself! It's been a long time since I've posted an update on our farmhouse progress. I've got plenty of catching up to do as far as sharing those projects. 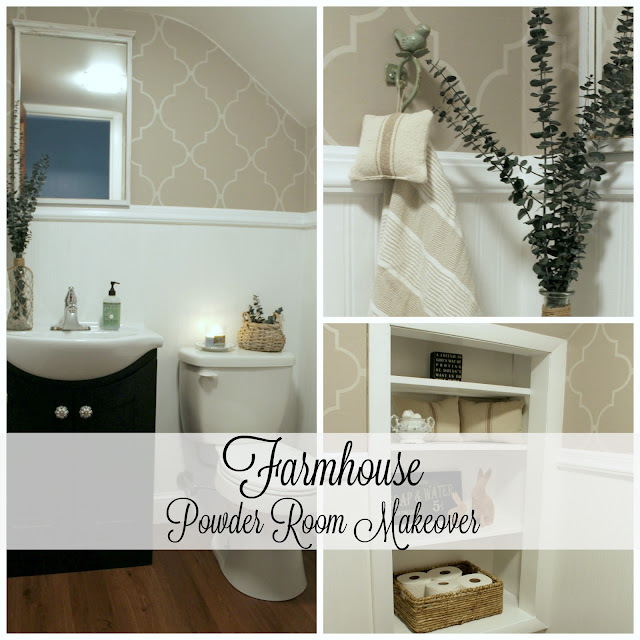 Today I thought I would start by sharing our powder room. Here's a shot of this space on closing day. At the time it was functioning fine, so we didn't have any plans of renovating since we had so many other areas of the house that needed attention. A few months later a pretty major leak changed those plans. We ended up having to rip everything out and re-build the floor which led to us completely renovating the space. It's been several months (I lost count exactly how long this reno actually took) but we now have a finished powder room that I'm not embarrassed for guests to use! Roby's aunt gave us the vanity for free and my mom gave us the mirror. By now everyone in our family knows to let me know if they are throwing something out! I added new knobs for a fresh look. 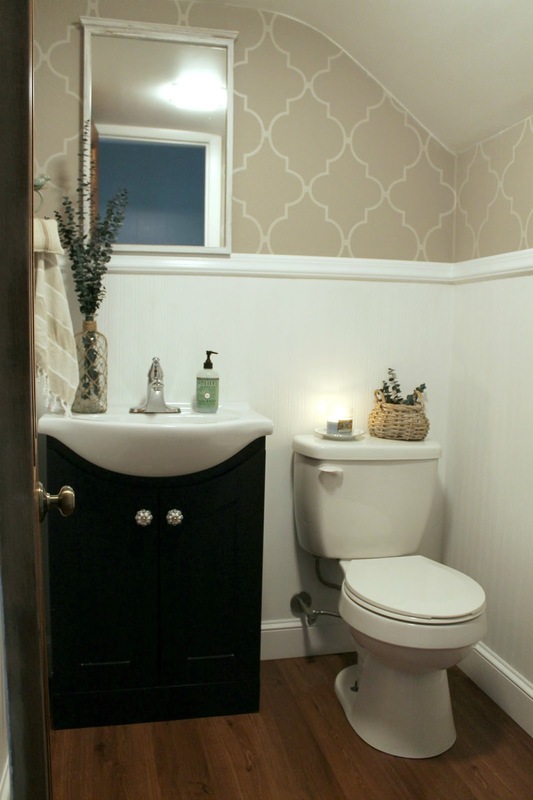 The patterned wallpaper is from Lowe's. 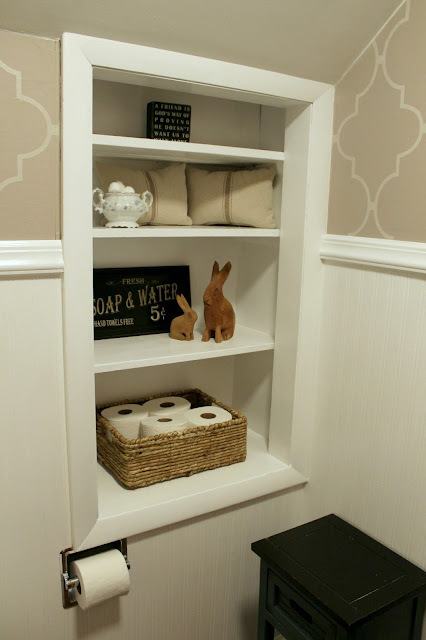 I chose a fun pattern for the top portion, and bead board for the lower portion separated by simple chair rail molding. Everything else received a few fresh coats of white paint. I found the cute bird hook on Amazon, and the vase and eucalyptus are from Michael's. The grain sack lavender sachets can be found in my Etsy shop. I love hanging these in our bathrooms. 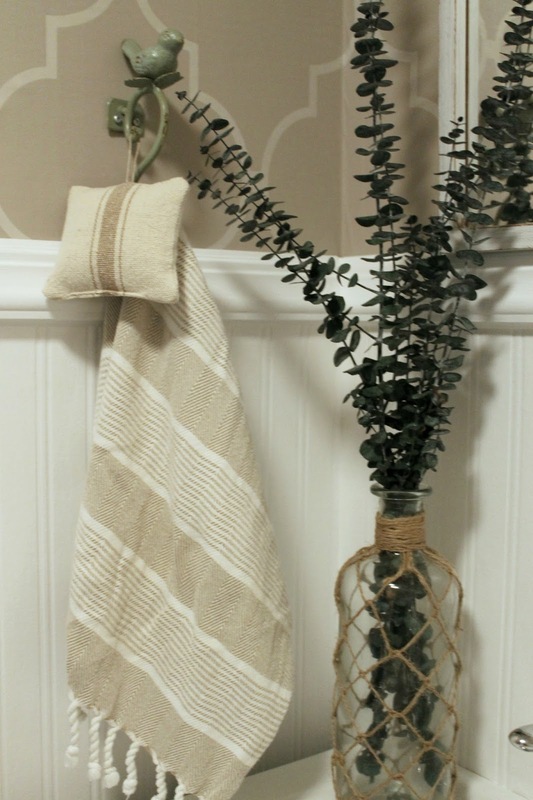 Our bathrooms smell clean and fresh without having to use sprays or plug-ins, plus I love the added farmhouse charm the grain sack adds. Things like building a new subfloor, installing new flooring, and purchasing a new toilet drove the price up a bit on this project. As far as all the cosmetic stuff, I was able to keep the cost down by accepting hand me downs and refreshing them with paint. Using wall paper and paint that I already had from previous projects helped too. We were really blessed to receive the vanity for free, but you can also find used ones at habitat stores. Sometimes all they need is paint and new hardware, so you can really save by shopping those kind of places first. 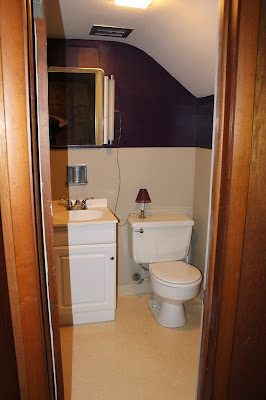 Another option is to refresh the one you already have with paint and new hardware like we did in our other bathrooms. I purchased a few new accessories, but mostly I shopped my house for items to display. I'm happy with the results, and so excited to cross this room off my project list! I hope you all have a very blessed day and I'll be back next Friday with a new post!